Kate Middleton is reportedly in labor. Let's celebrate by looking at pictures of the Royal Princess of the United Cakedom, "Cake Middleton." As a life-sized cake rendition of a human being, it's, predictably, equal parts impressive and a true terror to behold. Hold on to Your Crumpets: Kate Middleton&apos;s Officially in Labor! Princess Cake Middleton is 5'6", over 200 pounds, and mostly made of Rice Krispies Treats and butter pound cake. She is cradling a little bundle of joy (i.e., bundle of Rice Krispies Treats) to her frosted breast. 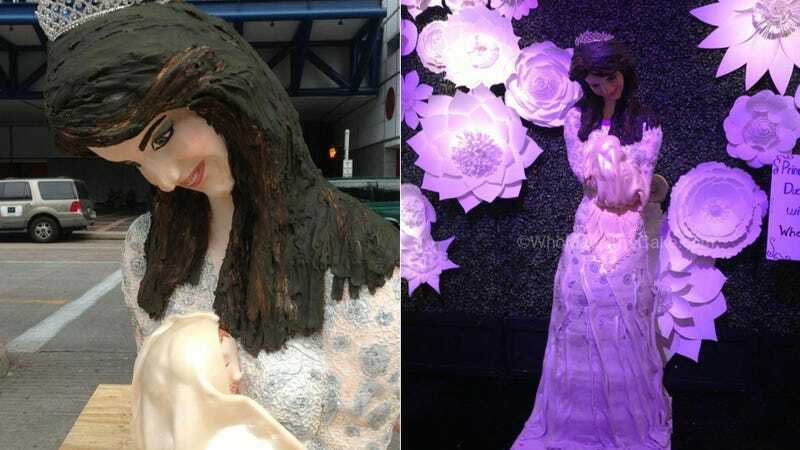 She was created by Houston-based cake designer Nadine Moon in an underground laboratory on a torrid, moonless night. Officials from the Bridal Extravaganza show at which Cake Middleton was first displayed have reached out to Kensington Palace to see if the Royal Family is interested in having the massive confectionary delight for themselves. Because, when you are a princess, people will send your staff emails that say "Congratulations on the pregnancy! I have constructed a 200 pound cake sculpture of you, clad in a customized dove grey satin gown with lace accents. If you're not too busy I can stop by England and drop it off sometime next week. Please LMK." As of right now, Kate Middleton is probably too busy to think about the cake.